Habit: Annual to subshrub (2)5--70(200) cm; proximal stem and leaves glabrous to variously hairy. Stem: 1, erect, or 2--25+, prostrate to ascending, simple or branched. Leaf: simple, alternate, often crowded proximally, petioled, generally +- elliptic to ovate or obovate, generally deeply 1--4-pinnately lobed, occasionally entire (then linear), lobes generally not or scarcely overlapping; distal generally +- reduced. 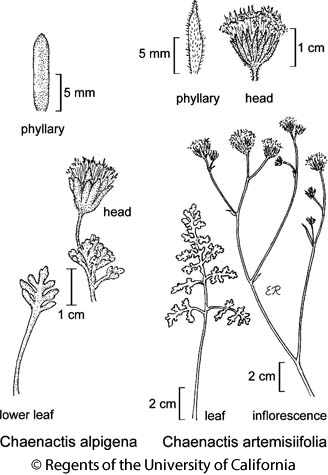 Inflorescence: heads discoid or radiant, 1--25+ per stem, generally in terminal cyme-like cluster; peduncle generally erect, hairs generally as on phyllary bases; involucre generally <= 15 mm diam, cylindric to obconic or hemispheric; phyllaries in 1--2 +- = series, generally linear to lanceolate, persistent, tips generally +- flat, generally +- green; receptacle flat to rounded, glabrous, generally epaleate. Flower: 8--70+; corolla white, +- pink, or yellow, generally open during day; anthers generally exserted, tips lanceolate to ovate; style tips linear, minutely bristly. Fruit: +- club-shaped, generally not compressed, +- hairy; pappus 0, crown-like, or generally of (1)4--20 persistent, +- fringed scales in 1--4 series, scales often fewer and/or shorter on outer fruit. Species In Genus: 18 species: western North America. Etymology: (Greek: gaping ray, for enlarged outer corollas of type sp.) Note: Species of sect. Chaenactis hybridize, especially in SCoRI/s SnJV, where identification can be difficult. Habit: Annual (15)25--90(200) cm; proximal hairs mealy, scaly, or powdery, generally +- white. Stem: generally 1; branches generally distal. Leaf: cauline in flower, 3--15(20) cm; largest blades +- deltate, +- flat, (2)3--4-pinnately lobed, not fleshy, nonglandular; 1° lobes generally 5--10 pairs, tips +- flat. Inflorescence: heads discoid, 3--20+ per stem; involucre +- hemispheric; longest phyllaries 7--10(12) mm, outer +- shaggy-hairy, tip erect, stiff, acute or scarcely acuminate. Flower: corolla white to +- pink, 5--7 mm, outer radial, +- erect, = inner. Fruit: 4--7 mm, compressed; pappus 0 or crown-like, scales +- 10, <= 0.5 mm. Chromosomes: 2n=16. Citation for this treatment: James D. Morefield 2012, Chaenactis artemisiifolia, in Jepson Flora Project (eds.) Jepson eFlora, http://ucjeps.berkeley.edu/eflora/eflora_display.php?tid=1958, accessed on April 19, 2019.
s SCoRO (in 1889), SW (exc ChI); Markers link to CCH specimen records. Yellow markers indicate records that may provide evidence for eFlora range revision or may have georeferencing or identification issues. Purple markers indicate specimens collected from a garden, greenhouse, or other non-wild location.